SPECTRUM is looking for volunteers! SPECTRUM’s volunteer project aims to recruit Service Users and Carers from different backgrounds, cultures and experiences to be part of our information, advice and Direct Payment support service team. Volunteers will ideally need to have some knowledge of Direct Payments or setting up support packages and have basic computer skills. ‘Introduction to Volunteering’ training will be provided. Provide you with full training, time to meet the staff team and understand how we do things before you become a volunteer. Make sure you know what will be expected of you. Will I have to complete an application and have an interview to be a volunteer? To find out what people want to get out of volunteering, those interested in volunteering start by having a friendly chat with the Volunteer Manager, to look at what you would like to achieve and what we need from you. How will my volunteer role fit with SPECTRUM’s aims as an organisation? SPECTRUM would not be where it is today without volunteers. We recognise volunteering has the potential to increase personal development as well as contribute to the organisation and its work. Due to the nature of my impairment I will need support with certain tasks. Can SPECTRUM provide this? Funding provided for the volunteer project in SPECTRUM Independent Living team unfortunately does not allow us to provide Personal Assistants. However, we can consider assistive technology such as large font keyboards etc. What are the advantages of volunteering at SPECTRUM? Volunteering for the Independent Living Team at SPECTRUM will provide an opportunity for volunteers to be involved in the work of the organisation, work towards their own personal development goals, meet new people and be part of a friendly team. 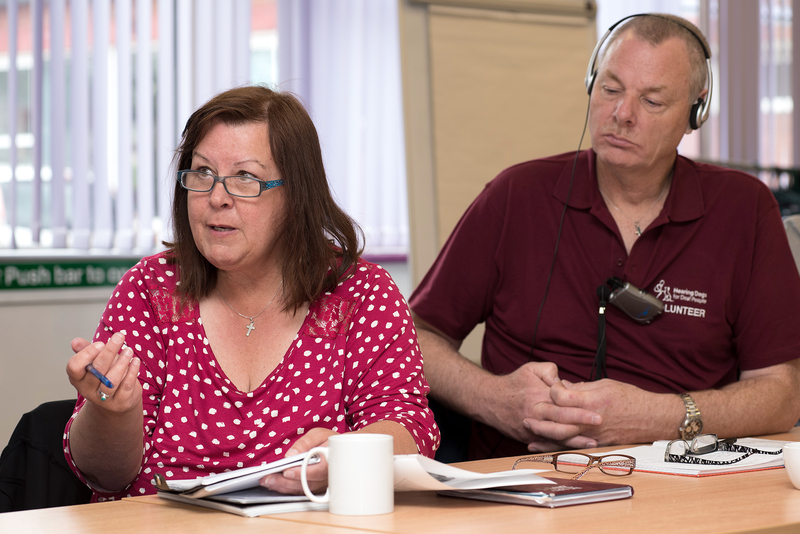 We are an organisation run by Disabled People and offer a friendly supportive environment. What tasks can I work on as a volunteer in the Independent Living Team? Volunteers in the team will provide Direct Payment Support, tasks which include supporting people with managing paperwork, finances, using the Personal Assistant Notice Board, supporting individuals with some aspects of recruitment, updating records, attending community groups to promote Direct Payments, signposting to community groups / support. Will I get expenses and how can I claim them? Basic travel expenses can be claimed providing a receipt is available. A training and induction programme will be provided tailored to your needs. You will also have the opportunity to work with a team of volunteers who run and control their own volunteer Peer Support Group. Volunteers will receive ongoing support from the Volunteer Manager and members of the Independent Living Team. Volunteers also have the opportunity to be part of a Volunteer Peer Support Group and support each other as peer volunteers. How much time do I have to give to volunteering? You can give as little or as much time to the Independent Living Team as you wish according to your personal commitments, but we do need a commitment to attend and at agreed times. I have specific skills I would like to develop. Can I develop these as a volunteer? It is very much the aim of the Independent Living Team’s Volunteer Project to support you in developing specific skills where possible. These may be around gaining confidence, personal development, moving towards employment etc. Can I leave if I do not like volunteering? It is entirely up to you to decide when you start and leave your volunteer role. Will volunteering effect my benefits? If you are concerned about volunteering affecting your benefits, we advise you to contact the benefit agency. It is usually viewed as a positive step but notifying the correct agency is essential. This may be possible depending on the work you do for the Independent Living Team. Click to listen highlighted text! Volunteering	Home»Get involved»Involvement opportunities»Volunteering SPECTRUM is looking for volunteers! show easy read Be part of a team that values your skills and contribution SPECTRUM’s volunteer project aims to recruit Service Users and Carers from different backgrounds, cultures and experiences to be part of our information, advice and Direct Payment support service team. Volunteers will ideally need to have some knowledge of Direct Payments or setting up support packages and have basic computer skills. ‘Introduction to Volunteering’ training will be provided. The benefits of becoming a volunteer at SPECTRUM Gain skills and experience to help Disabled People and Carers Improve your employment opportunities Be part of a team and have fun with a great bunch of people Learn about our organisation and its values Make new friends and contacts The kind of work you will be doing as a volunteer Work with experienced support workers to assist people on Direct Payments Support people on the telephone Refer people to organisations in the community Write letters and provide administration support In return we will: Provide you with full training, time to meet the staff team and understand how we do things before you become a volunteer. Make sure you know what will be expected of you. Pay your expenses Find out more Contact Berni Vincent, Volunteer and Training Manager, on 02380 330 982 or email berni.vincent@spectrumcil.co.uk for more details Will I have to complete an application and have an interview to be a volunteer? To find out what people want to get out of volunteering, those interested in volunteering start by having a friendly chat with the Volunteer Manager, to look at what you would like to achieve and what we need from you. How will my volunteer role fit with SPECTRUM’s aims as an organisation? SPECTRUM would not be where it is today without volunteers. We recognise volunteering has the potential to increase personal development as well as contribute to the organisation and its work. Due to the nature of my impairment I will need support with certain tasks. Can SPECTRUM provide this? Funding provided for the volunteer project in SPECTRUM Independent Living team unfortunately does not allow us to provide Personal Assistants. However, we can consider assistive technology such as large font keyboards etc. What are the advantages of volunteering at SPECTRUM? Volunteering for the Independent Living Team at SPECTRUM will provide an opportunity for volunteers to be involved in the work of the organisation, work towards their own personal development goals, meet new people and be part of a friendly team. We are an organisation run by Disabled People and offer a friendly supportive environment. What tasks can I work on as a volunteer in the Independent Living Team? Volunteers in the team will provide Direct Payment Support, tasks which include supporting people with managing paperwork, finances, using the Personal Assistant Notice Board, supporting individuals with some aspects of recruitment, updating records, attending community groups to promote Direct Payments, signposting to community groups / support. Will I get expenses and how can I claim them? Basic travel expenses can be claimed providing a receipt is available. Will training be provided? A training and induction programme will be provided tailored to your needs. You will also have the opportunity to work with a team of volunteers who run and control their own volunteer Peer Support Group. What support is available for volunteers? Volunteers will receive ongoing support from the Volunteer Manager and members of the Independent Living Team. Volunteers also have the opportunity to be part of a Volunteer Peer Support Group and support each other as peer volunteers. How much time do I have to give to volunteering? You can give as little or as much time to the Independent Living Team as you wish according to your personal commitments, but we do need a commitment to attend and at agreed times. I have specific skills I would like to develop. Can I develop these as a volunteer? It is very much the aim of the Independent Living Team’s Volunteer Project to support you in developing specific skills where possible. These may be around gaining confidence, personal development, moving towards employment etc. Can I leave if I do not like volunteering? It is entirely up to you to decide when you start and leave your volunteer role. Will volunteering effect my benefits? If you are concerned about volunteering affecting your benefits, we advise you to contact the benefit agency. It is usually viewed as a positive step but notifying the correct agency is essential. Do I need to be DBS checked? This may be possible depending on the work you do for the Independent Living Team.